This is the standard notation used on Ordnance Survey Landranger maps. Each reference consists of two letters identifying a 100,000 metre square block then three digits defining the Easting and finally the three digits defining the Northing with reference to the South West corner of the block. NN166712 is the grid reference for the summit of Ben Nevis. Where you are given the map number ( For Ben Nevis = 41) it is acceptable to omit the two initial letters e.g. 166712. (Instructions on how to read the references are given on the OS maps). An indication of this mountains height rank within its class. Where two mountains share the same height they are ordered alphabetically. The number of ascent routes currently available on Munromagic. The UK is covered by 204 Ordnance Survey Landranger 1:50,000 scale maps. Maps numbered 1 to 86 cover Scotland but for the highest mountains (Munros) only 23 maps are required. The name given roughly describes the area covered by the map. 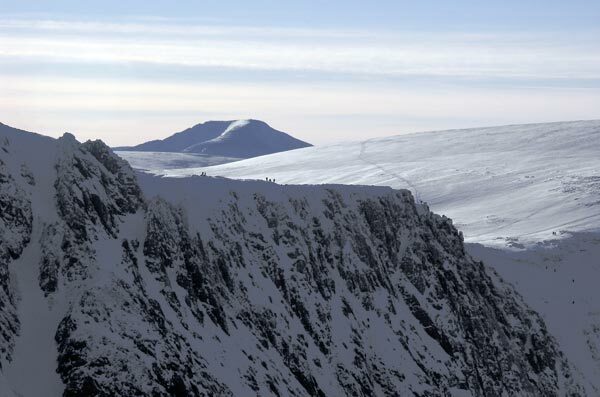 The summit of the massive Ben MacDui is bounded to the W and SW by the steep slopes of the Lairig Ghru. There are routes up these steep slopes but they are not recommended. To the S lies a long ridge, which gives an easy ascent from Glen Luibeg. The western slopes of this ridge can be accessed from the N ridge of Carn a Mhaim. This route takes you up steep slopes onto boulder fields. To the east of this route and of the summit lie the precipitous cliffs of Coire Sputan Dearg, however a safe route E then NE leads down to Loch Etchachan. From the summit, gentle slopes run N to Cairn Lochan, and down through the crags of Coire an Lochain to the carpark at the ski centre, or NNE to the summit of Cairn Gorm. Relatively Remote Mountain navigate with care. Steep slopes on or near ascent routes. Stony/rocky Slopes on or near ascent routes. Crags within 1km of summit. Temperature decreases by 1degree C for every 100m of ascent. Wind usually increases with altitude. Visibility can change markedly with cloud level. River/Stream levels can increase markedly in one day. From above Loch Etchachan, showing the path up to Beinn MacDuibh; 7th October 2007. Coire Sputan Dearg (Ben Macdui) taken from the crossing at Luibeg Burn. 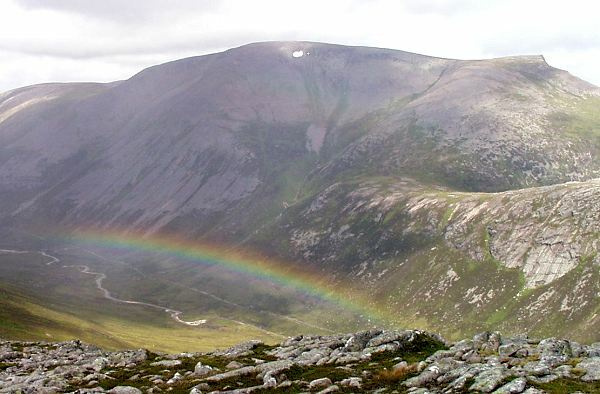 Ben Macdui from Devil's Point, rainbow courtesy of a passing shower. Climbers on top of Snechda with Ben Macdui in the distance . A selection of weather forecasts local to #GetMountain.Top_Name#. Ordnance Survey digital maps are also available to members. A selection of local accommodation options who advertise with Munromagic.com. sponsored accommodation listings for this area. The summary information of one or more ascent routes that include Ben MacDui. Click on the route title to load the full content for that route. 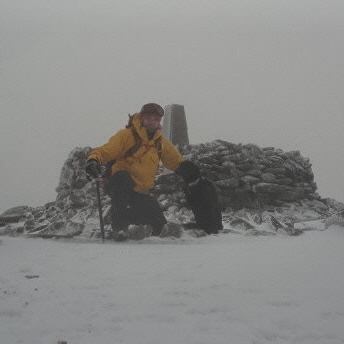 1 1745 m 33.49 km 10 hrs Ben MacDui, Derry Cairngorm and Carn a' Mhaim A long rewarding day which took 11.5 hrs to complete. Care is required when crossing the bouldery summits of Ben MacDui & Derry Cairngorm. A fine ridge walk from Carn a'Mhaim & Ben MacDui. A moderate although long route for the reasonably fit. 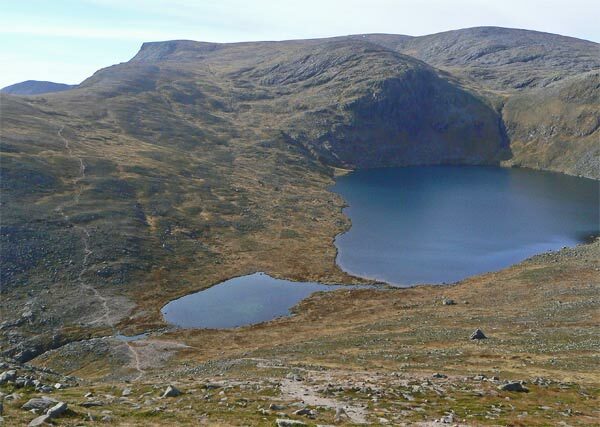 2 1520 m 29.09 km 8.5 hrs Ben MacDui This is a long route requiring endurance, but the ascent is not difficult. The route time can be shortened by cycling to Derry Lodge. 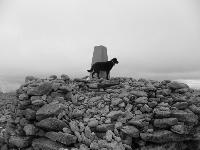 Jorja at the top of Ben Macdui. May 2014. From Linn of Dee, it's a big day even for the Wee Black Dug. You need to be a member to have a route log. If a member has uploaded a tracklog as part of their personal route log and opted to share it then it will be presented here. You can view a members route overlayed on an online map or download the KMZ file for use in Google Earth. Post a few words about Ben MacDui or read what others have had to say. Showing the most recent 5 of 11 comments. Would you like to view all 11? Done as a ski tour in stunning conditions on the 12th of december 2009. Blue skis, plenty of snow and a temperature inversion! What more could you want! Long circuit expedition from ski centre on a gloriously clear day. Bumped into some reindeer on the way to the plateau, easily gained Macdui to spectacular 360 views of the Lairig Ghru. With such weather Derry Cairngorm beckoned, and a deceptively quick descent to the bealach (looking back up it seems a LONG way to return!) led to a beautiful summit moment as the wind quietened and the serenity of the landscape sucked us in. Eschewing the slog back up to the McDui summit, we dropped into the glen between Macdui and Cairngorm and here saw some incredible cliffs, the gigantic mass of the plateau we had earlier traversed hewn along its flank, exposing the ancient strata. A brief scramble up a river gully and a 45 minute traverse brought us to the shoulder of Cairngorm, the summit temptingly close, but with the weather clearly about to change violently we reluctantly passed it by and returned down the spur to the ski centre. Awesome day. A good few years ago, whilst I was in the venture scouts, we did a '4 peaks challenge' for charity. 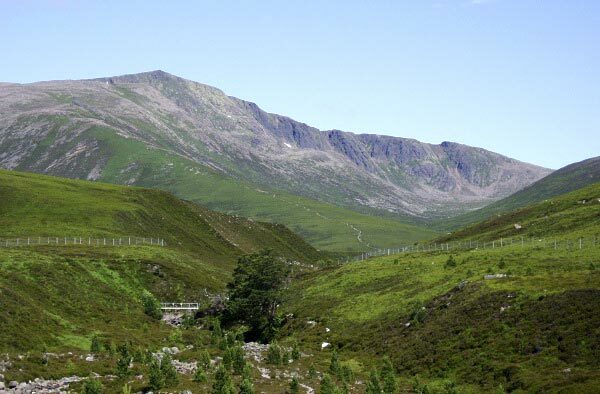 The walk started in the ski centre car park, heading across the Chalamain pass towards the Lairig Ghru. Crossed over and up Braeriach. Round towards Angels Peak and Cairn Toul then descending down to Corrour Bothy. Next up Taillear's burn to Ben Macdui. Across plateau to Cairn Gorm and down to car park. Think it was 16-17 hours. In retrospect, should have included Devils Point, although I seem to recall being absolutely knackered by that point! Survived on Tesco's 'Kick' drink. Try it out! Route: Start/Finish: Corrour Bothy > zigzagged east up steep slopes to ridge N of Carn a' Mhaim > followed ridge to summit > retraced route N then up broad ridge SE of Allt Clach nan Taillear, swinging W to summit of Ben MacDui > Back E along FP to Creagan a' Choire Etchachan > S to summit of Derry Cairngorm > Down to Luibeg Burn > FP S then W back to Corrour Bothy Horizontal Distance Travelled: 20km	Vertical Height Ascended: 1126m	Time Taken: 9 hrs Weather: Dry, bright. Temperature: Warm. Wind: Light SE. Cloud base: Well above summits. Visibility: Great. Comments: Climbed as part of a long day on the hill one pleasant summer day. We were a party of two, based at Corrour Bothy for three nights. Terrific hill day! A full written account of a climb submitted by our members. You can prepare your own write up by first making an entry in your route log and then visiting the logging section above.